The grant system website was hit with technical issues last night as the deadline drew near. STUDENT GRANT SYSTEM SUSI has extended the closing date for grant applications for this academic year until midnight on Monday. The deadline has been pushed back after the student grant website was hit with technical problems last night as the original deadline of midnight on Thursday drew near. 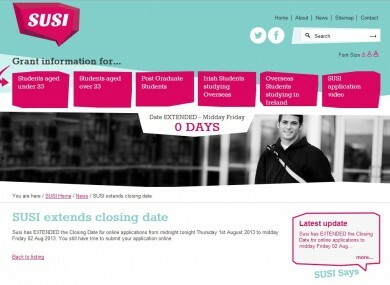 SUSI originally extended the deadline until midday today but has now pushed it back by a further 84 hours to allow students time to submit their applications for the coming academic year. The technical problem was resolved just after midnight when students were again able to submit applications. SUSI apologised to applicants for the inconvenience and said that no student data was affected. Almost 15,000 applications have been received this week ahead of the closing date. SUSI says it believes it has received almost 80,000 out of the anticipated 90,000 applications it has forecast for this year. Students will still be apply to apply for a grant after Monday but applications received after that will be prioritied so that people who applied on time will receive their grants when the first scheduled payment is due in late October. SUSI set the closing date for this time of year to allow time to ensure qualifying students receive their grant when they return to college in October. There were significant problems with the new SUSI system this year with long delays for some students. Around 118 third level students were still waiting for a decision on their application in June – after the college year had already finished. The head of SUSI said this week that a number of changes have been brought in to ensure that the same mistakes do not happen this year. Email “Heads up, students: SUSI extends deadline for grant applications until Monday”. Feedback on “Heads up, students: SUSI extends deadline for grant applications until Monday”.